It may have a damp start, but count on cetacean lovers to be out in festive force. The Festival of Whales in Dana Point glub-glubs, with gleeful doings and blowhole-beautiful events, on March 3, 4, 10, and 11, 2018. 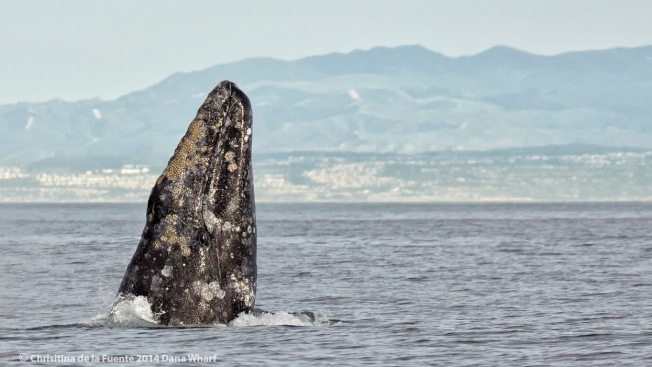 Festival of Whales in Dana Point: So do the whales migrating along the California coast reroute their journeys to coincide with this long-running, two-weekend whoopdidoo, like we humans might reroute a journey to see a special attraction or event? Assuredly they do not, but you have to hope that the whales passing by on March 3-4 and again on March 10-11 can sense the sheer celebratory joy we landlubbers are feeling over our whale friends out in the not-so-deep. A parade, Ocean Awareness Day, a rubber ducky derby, classic cars and boats on display, and other cetacean-riffic stuff is on the dock(et). LA Lantern Festival: There's still time to honor the Year of the Dog in a festive and mirthful manner, though that moment is winding down. The traditional lantern festival comes at the close of the new year fun, and this free-to-join gathering at the Chinese American Museum will include a caboodle of auspicious and awesome activities, all to send off the Lunar New Year in a grand way. Music, dance, and food trucks will be a part of the happening, which is on from noon to 7 o'clock, rain or shine, on Saturday, March 3. Disney California Adventure Food & Wine Festival Opens: We'd never ask you to not make a beeline for that Dole whip you adore, or the dill pickle, or the Tiger's Tail, or whatever treat you need to have while at Disneyland Resort. But the edible vista, which is already quite vast at the Happiest Place on Earth, widens considerably each late winter and spring, when a host of chefs stop by to demo and different treats are added to the mix during this food-fun party. It's all happening at Disney California Adventure, from March 2 through April 12, 2018, mmm. Big Bear Polar Plunge: Are we in the frostiest moment of this winter thus far? When the mountains are seeing snow and we're seeing our breath, even at the lower points around Southern California? Here's something to make it all a bit colder: Several people will dash into Big Bear Lake on Saturday, March 3, and, no, the waves will not be heated in any manner. Here's the warm-the-heart part of this chilly event: It's all to lend fab support to Special Olympics Inland Empire. Want to participate? Or donate? You can, absolutely. Candytopia Opens: The snapshot-bright experience was due to open in December near downtown, but alas: Permit issues prevented that debut. But sweet things, like candy, have a way of sticking around, though the walk-through location is moving west. The new spot is Santa Monica Place, the opening date is Friday, March 2, and the run is scheduled for four months. Inside? You'll find sculptures and artwork made from confections, sweet pose-ready corners, and such. Tickets? No lollygagging, lollypop people: Your journey begins here. Pop-up Mural: The iconic wings from artist Colette Miller have been an Instagram favorite, and an uplifting symbol of the City of Angels. Now Ms. Miller is creating a pop-up artwork next to The Brig in Venice, all to honor "...momentous women in aviation, film and across all industries." American Airlines is a partner on the project, which was inspired by Bonnie Tiburzi Caputo, "the first female pilot to fly for a major U.S. airline." Want snap a photo of the piece, if you've already taken a picture of every other Miller-marvelous wing set you've seen? It's up through Saturday, March 3 at 6 o'clock.